The Concord Museum invites you to reacquaint yourself with the life of this towering figure by reading Frederick Douglass, Prophet of Freedom, by Yale historian, David Blight and attending a conversation with Professor Blight on Wednesday, May 16, 2019, at 7:00 p.m. This event is free, but advanced registration is required. Register here. It is in this spirit of using history to foster dialogue that the Concord Museum unites with other cultural institutions to sponsor this spring Community Conversations project. This Spring, explore, with intellectual vigor and social sensitivity, power, protest, equality, patriotism, and the value of indignation with the Concord community. Please note the varying locations for Community Conversations programs. 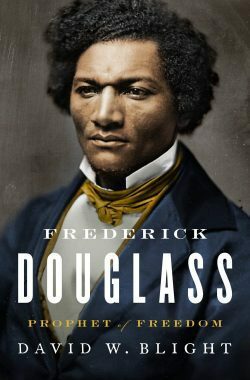 Copies of Frederick Douglass, Prophet of Freedom, by David Blight can be obtained through the Concord Free Public Library and the Concord Bookshop. Additionally, the book will be available for purchase and signing by the author following An Evening with David Blight on May 15, 2019. All of these programs are Free, but advanced reservations are required. Reserve online or call (978) 369-9763 ext. 216. Join us for a conversation with prize-winning historian Robert A. Gross and Robbins House President Maria Madison as they examine the historical context in which Frederick Douglass spoke in this historic town in 1841 and 1844. 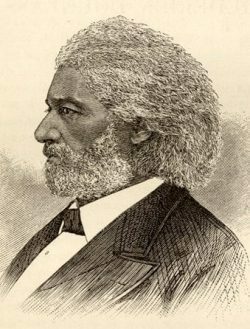 Learn about Douglass’ visits and the key figures who he met with including the leaders of the Middlesex County Antislavery Society and the Concord Ladies Antislavery Society. Free. Register here. 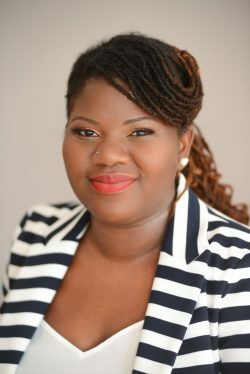 Wellesley Professor Kellie Jackson, author of Force & Freedom: Black Abolitionists and the Politics of Violence addresses the tactical use of violence among antebellum black activists. Free. Register here. Join the Concord Museum in welcoming renowned historians David Blight and John Stauffer as they discuss one of the most important people of the nineteenth century: Frederick Douglass, the escaped slave who became the greatest orator of his day and one of the leading abolitionists and writers of the era. Free. Register here. Join Special Collections Curator Leslie Wilson and Head of Reference Barbara Gugluizza of the Concord Free Public Library for a discussion on Narrative of the Life of Frederick Douglass. This 1845 memoir and treatise on abolition was written by famous orator and former slave Frederick Douglass during his time in Lynn, Massachusetts. Leslie Wilson will also share historical documents related to Frederick Douglass’s associations with Concord. Free. Register here. As the culminating event in our Frederick Douglass Community Conversation initiative, the Museum will present a screening of James Baldwin: The Price of the Ticket, a film described as “an emotional portrait, a social critique, and a passionate plea for human equality.” Free. Register here. The Concord Museum in partnership with the Concord Free Public Library, Minute Man National Historical Park, Fenn School, Mass Humanities, The Umbrella, Concord Bookshop, Friends of Minute Man National Historical Park, The Old Manse, Thoreau Society, The Robbins House, The Walden Woods Project, First Parish in Concord Transcendentalism Council, and other cultural partners. Engraved portrait of Frederick Douglass. From Howard Carroll’s Twelve Americans (New York: Harper & Brothers, 1883). CFPL Basement Collection. Courtesy of speaker, Kellie Jackson. Courtesy of speaker, David Blight. 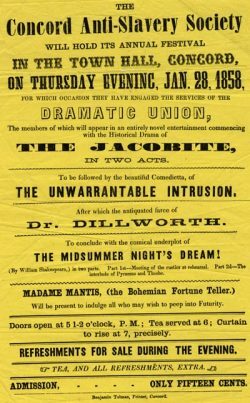 The Concord Anti-Slavery Society Will Hold Its Annual Festival in the Town Hall, Concord, on Thursday Evening, Jan. 28, 1858 (broadside notice). CFPL Concord Pamphlet Collection. 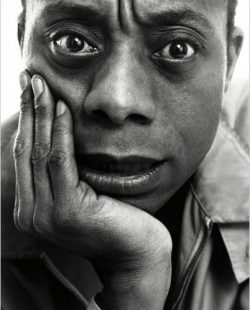 James Baldwin, writer, New York, 1963. Richard Avedon. New York Times.